Have you seen the going price for raspberries right now? $4 for half a pint. 4 ounces! Good grief. Just think if you had your own raspberries to add to your summer berry harvest. Haul them out to the local farmers market and score! People would flock to your tent. Offering local organic berries to your community, raspberries at that. You would have something special. 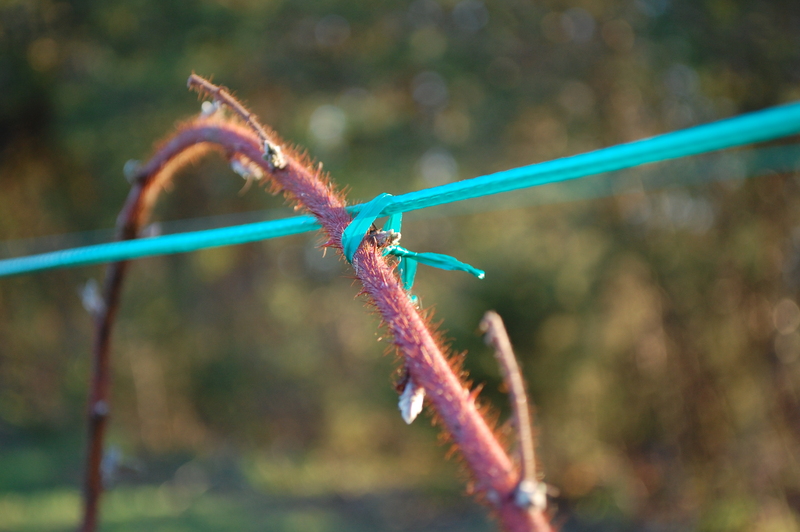 We planted two raspberry plants and a grape vine last year. We just knew that the grape vine would do well but we were unsure about the raspberries. To our surprise, it was just the opposite. 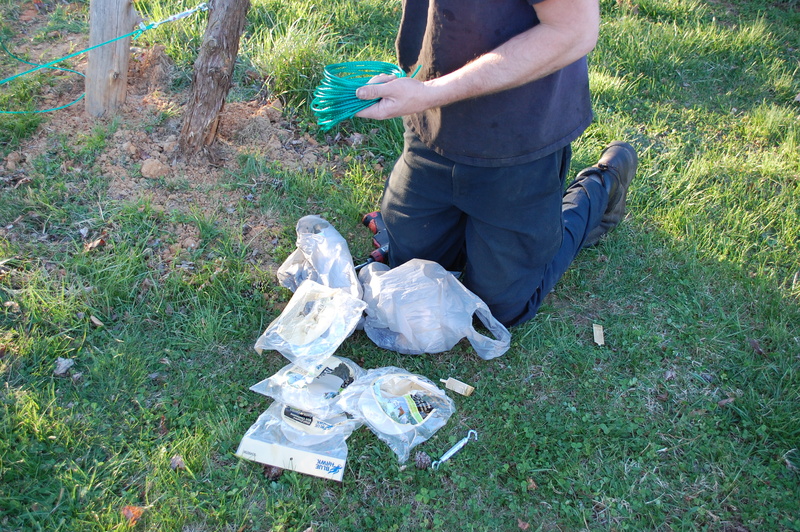 We planted them when they were just 2′ tall and this spring they have over 9′ canes and plenty of them. It’s crazy. Their growth caught us off guard making us realize that we had to build a trellis asap! 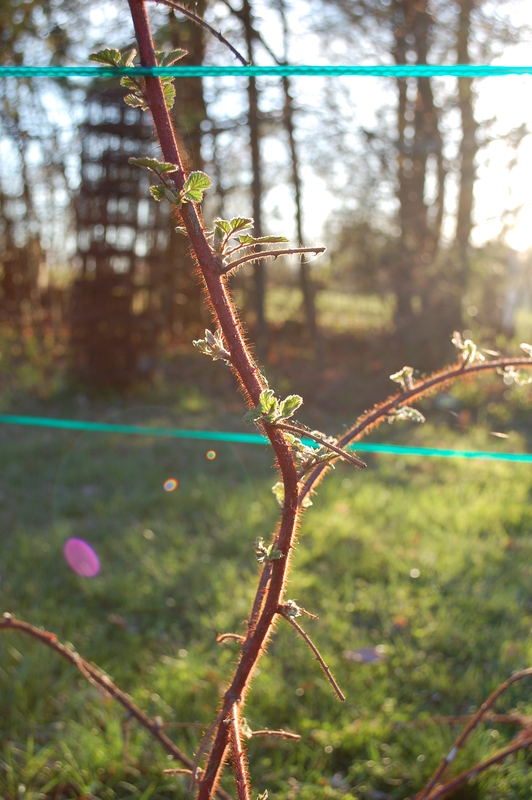 If you’re wanting to grow raspberries, a trellis is a must. I’m sure they will grow and bear berries without one, but a trellis will help them grow healthier berries, provide a higher yield and make harvesting easier. There are several different styles you could go with; we decided that a V-shaped trellis would work best for our plants. We started with 4 posts that we cut a few years ago for a barn we were working on. While that project was put on hold, another got started – and finished! We dug four holes, two on each side, about 3′ deep. Allowing the posts to rest in the holes at an angle forming what looks like a “V” on each end. Daniel then took 2 scrap 2×4’s and screwed one into the two posts on each side, immobilizing them while the we cemented the posts in. He then cemented each post. It took 2 bags of cement for all 4 posts. We had to go to Lowe’s to scope out potential hardware. We were shocked at how much wire was going to run us. We explored all of our wire options standing there in the aisle of what seemed like hours. 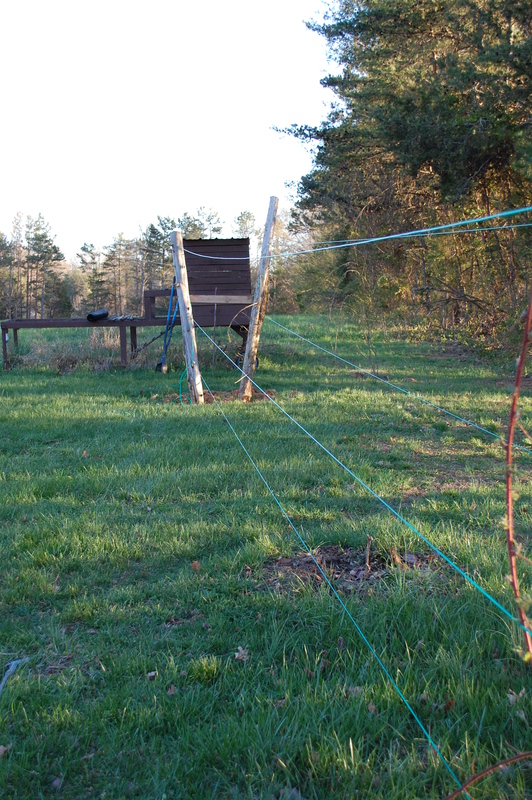 Finally, we decided on clothes line wire. 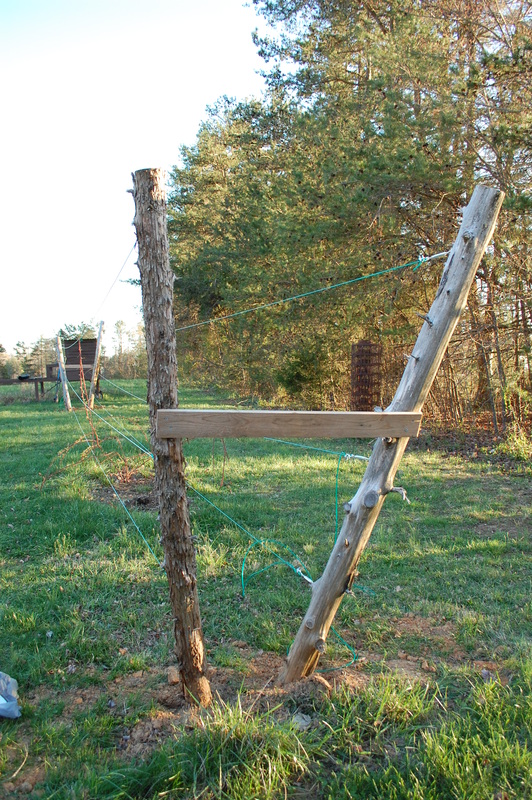 We made our trellis around 43′ long and needed 3 runs of wire on each side. So we snagged 6 bags of the coated clothes line, which by luck happened to be 50′. Luckily, I have an amazing husband. He’s so knowledgeable and hard working. He knew exactly what we needed to rig our lines up: 6 turnbuckles, 12 eye bolts, and 12 wire clamps. Daniel then screwed in the eye bolts on each post (3 on each – 12 total). 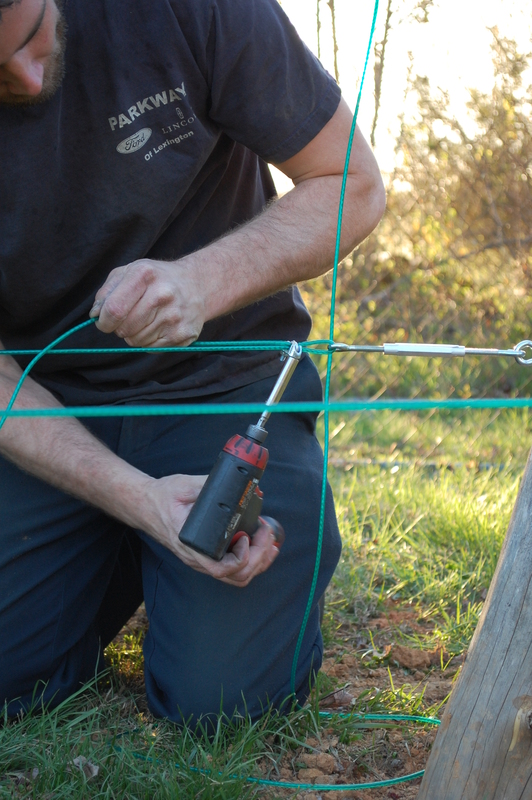 Then he clamped the 6 separate wires through 6 of the eye bolts. On the opposite side of the wire that has already been clamped, he attached the turnbuckle and ran it all the way out. 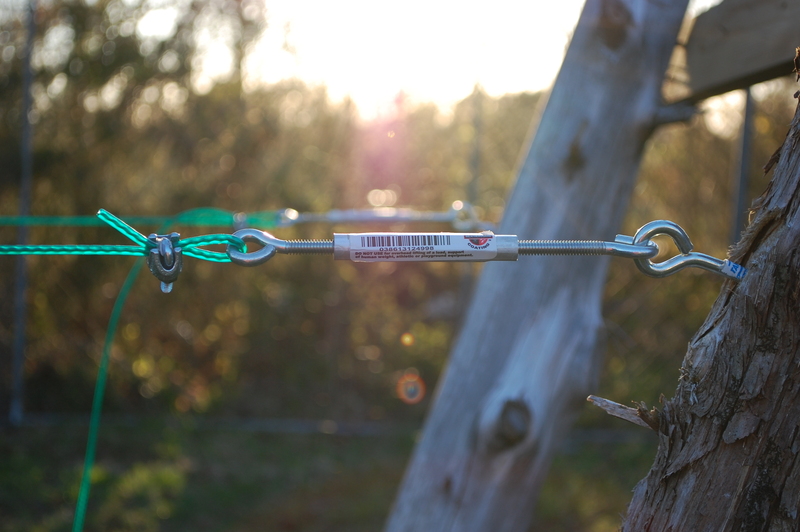 As he ran the wire through the turnbuckle he pulled it as taught as he could and secured it with another wire clamp. Now he was able to tighten the turnbuckle picking up any slack and finish with trimming the excess wire. He did this with the remaining 5 lines. With already having the posts we were able to save around $40. The hardware and cement ran us around $80. We really thought we would have been able to come out even cheaper but didn’t really “shop around”. 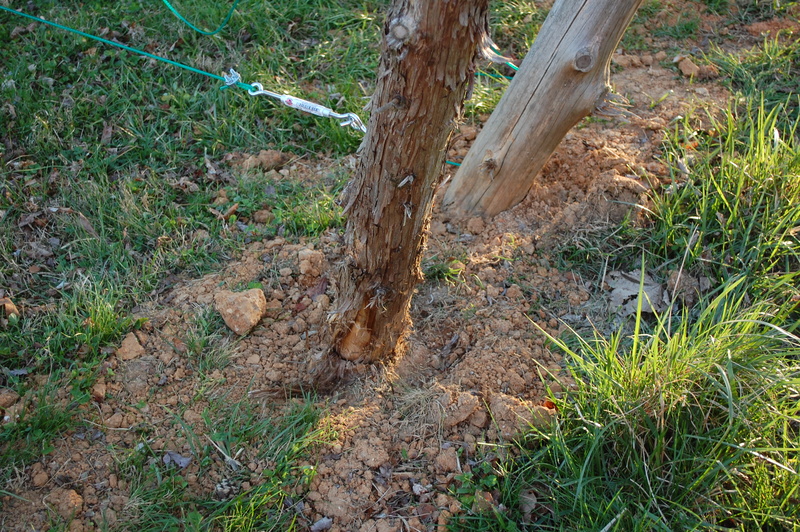 The wire that you typically would see on a trellis was going to run a lot more than $80 alone. So we opted for the cheaper, less appealing, because we knew we could make it work. Each cane only lives for 2 years. Once they turn grey you will want to trim the cane off. 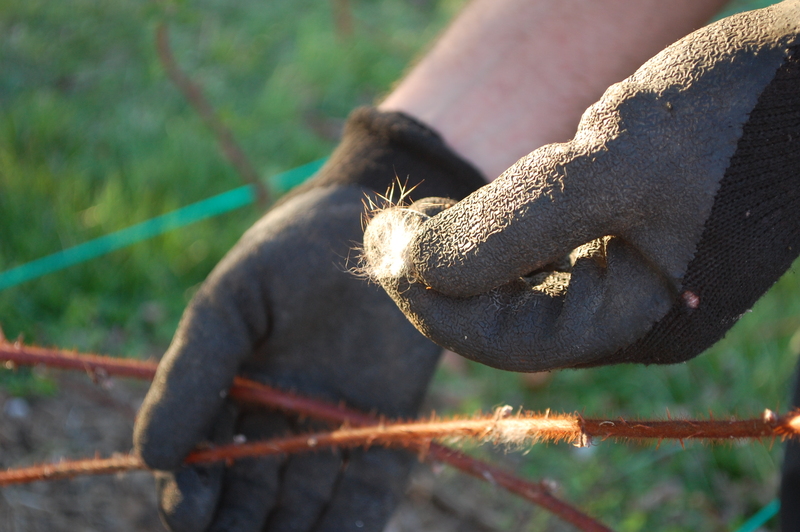 You should also scope out your land before you plant your raspberries plants. They shouldn’t be planted within 600 feet of wild blackberries. So get familiar with your land, plant away from the blackberries and look for areas that will receive full sun. Others will love your raspberries as much as you do! These others will happen to have fur. Yep, rabbits. They will eat your plants UP. So, set up rabbit gums to catch them or plan on hunting them one night. Rabbit is a very tasty meat to incorporate into your diet. If you’re not into that, then you can always sell them. People around here pay $5-$10 per rabbit. 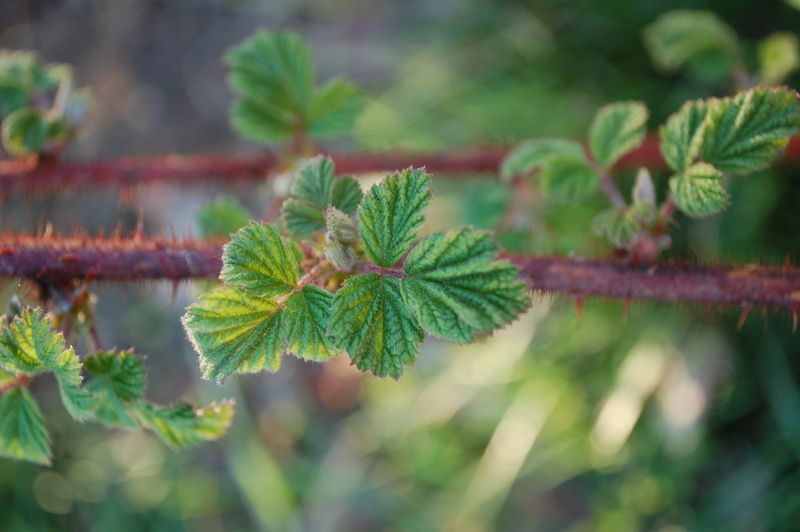 Whichever way you choose, you’ll need to decide on something because once they find your plants you will need to find a way to save your raspberry plants. You spend way too much time and money to let these little fellas ruin them. I’ve learned that you can’t be “soft” if you’re going to try to be self sustained because you will only end up with your feelings hurt. So do it for the sake of your plants. As they benefit from the lack of rabbits you can also benefit from the harvest of them! Adding a berry variety to your homestead is a great thing. From the health benefits of raspberries to the rarity of them at the market, you’ll be adding something special to your homestead. Not to mention how much fun it is picking them! < Previous Go get that “dough”! Next > THE Fair is coming! 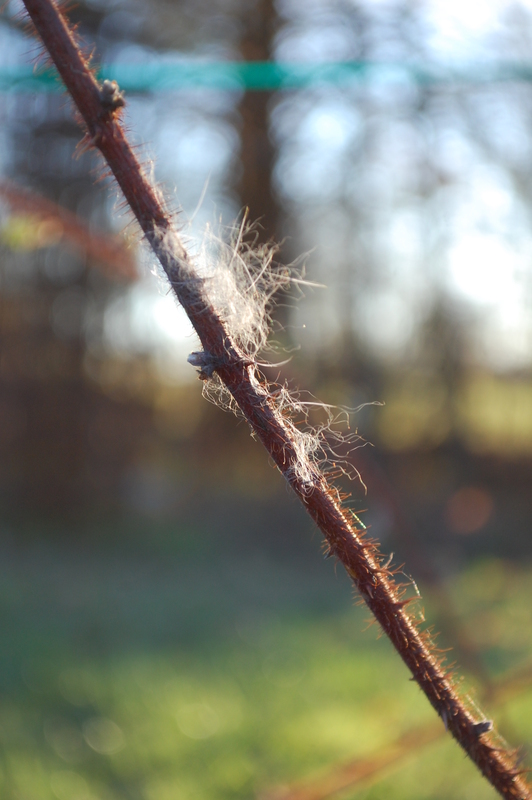 Check out this post on trellising raspberries from the Hardison Homestead. Turnbuckles! That’s just what the Funny Little Farm needs!